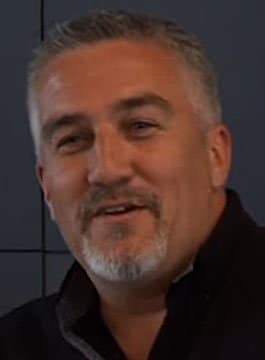 Paul Hollywood is the star of BBC One’s ‘The Great British Bake Off’ and the American version ‘The American Baking Competition on CBS. The son of baker, Paul originally trained as a sculptor before his father persuaded him to join the family business. He went onto become head baker at some of the most exclusive hotels in the UK including Cliveden, Chester Grosvenor and The Dorchester where he gained a reputation as an innovator and one of the country’s finest artisan bakers. Paul later took the opportunity to travel extensively through Cyprus, Egypt and Jordan, visiting remote villages to discover ancient techniques for baking bread and, on one occasion, travelling to a Bedouin encampment and baking in the desert on an upturned cooking pot. On his return to the England, he launched the Paul Hollywood Artisan Bread Company. Paul has been a judge on ‘The Great British Bake Off’ since the start, with the most recent series ending on a high of over 15 million viewers following the show’s move to its new home on BBC1. Hollywood has also judged ‘Junior Bake Off’ and celebrity versions for Sport Relief and Comic Relief all alongside Mary Berry. The show is now seen in more than 18 countries around the World including the US and Australia. In May 2013 he appeared as judge on the US version of ‘Bake Off’, ‘The American Baking Competition’ which aired on CBS. His own series include ‘Paul Hollywood’s Bread’ and ‘Pies & Puds’. Paul makes regular contributions to The Telegraph, The BBC Good Food Magazine, Olive Magazine, Waitrose Magazine and has written for both The Observer and The Daily Mail. Paul advises and trains at corporate level, working extensively with the Flour Advisory Board as well as hosting and presenting large demonstrations and award ceremonies. In 2014 Paul undertook his first live tour, ‘Paul Hollywood – Get Your Bake On!’ which saw him hosting an evening of live baking, comedy and fun at theatres across the country. Paul is available to present anecdotal speech, motivational speeches and to act as an awards host.